Between 1940 and 1945 the network of concentration camps in annexed Poland known as Auschwitz Birkenau killed an estimated 1.1 million Jews, Poles, Roma and Soviet prisoners of war. The camp was a machine of death, its name now synonymous with torture, gas chambers and the Holocaust. In 1979 it was designated a UNESCO World Heritage Site and is visited by an estimated 1.4 million people a year (number taken from 2011 estimate.) I've visited a few different Holocaust memorials and each time I'm struck by the way that each person around me experiences it. 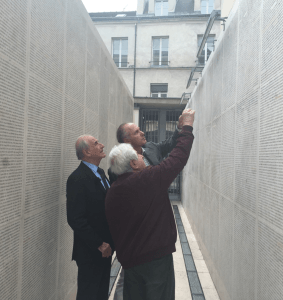 As I walked through the Mémorial de la Shoah's Wall of Names in Paris' Marais district, I noticed people running their hands along certain names, lingering slowly to let the realization of the horrors committed sink in. Others calmly walked by, noting the names but ultimately moving further inside quickly. The idea of a memorial as a tourist "attraction" feels odd to me. I love learning the history of a new place, connecting its now to the good and bad of its earlier years and soaking in the context. As I stood in line to enter the Anne Frank House in Amsterdam I remembered the scenes from "Nuit et brouillard"(Night and Fog), the 1956 French documentary by Alain Resnais that looked at the abandoned grounds of Auschwitz and Majdanek a mere 10 years after their liberation. It's black and white depictions of the scene of so much horror is sobering, emotional and ultimately unsettling. The monochrome shots tear at your soul, urging you to examine how these atrocities could have occurred in a so-called modern society. The pieces that always stick with me are the personal stories and recollections of survivors. They lived through hell and their words carry a weight that should cut through eternity. These memories must be remembered. Seeing the actual diary of a young teenage girl who was sent to her death at the age of 15 for simply being Jewish brought me to tears. I stood in a line of English, German and Dutch tourists viewing her writings and barely a word was spoken. As soon as we left the tiny house, each one sparked up conversations about nationalism and anti-Semitism in each others own country. The house of remembrance had done its job. My wife leads a pilgrimage each year for incoming college students to London and Canterbury that aims to connect them with the roots of the Episcopal/Anglican faith. The students walk through Canterbury Cathedral and Westminster Abbey seeing the formation of their faith tradition come alive in front of their eyes. A pilgrim's eyes see not with wonder but discovery. They search for meaning, connection and context to inform their present lives. That's how these sites of remembrance must be approached. The Santayana quote "those who cannot remember the past are condemned to repeat it," should live in our hearts. Simply visiting sites of remembrance and not letting ourselves be changed by their sobering realities is a disservice to our own selves. See not as a tourist looking for beauty, but as a pilgrim craving meaning and discovery. In that meaning, you'll see a deeper beauty, one that can change your worldview.